CoolClouds, a US-based cooling company founded by a Georgia Tech professor and a former manager of a thermal research group at Intel Labs, wants to turn the world of PC cooling upside down. In Q1 2014, CoolClouds plans to begin production on its first consumer product, SuprCool PC. The cooler is aimed squarely at overclockers and gamers aiming for the very best thermal performance. 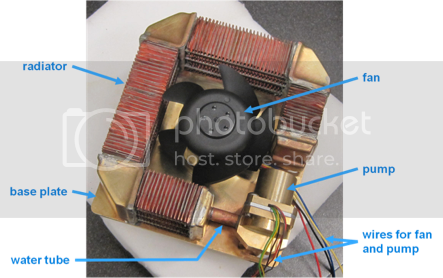 They claim the hybrid water/air heatsink will be the first on the market to cool down 300w. 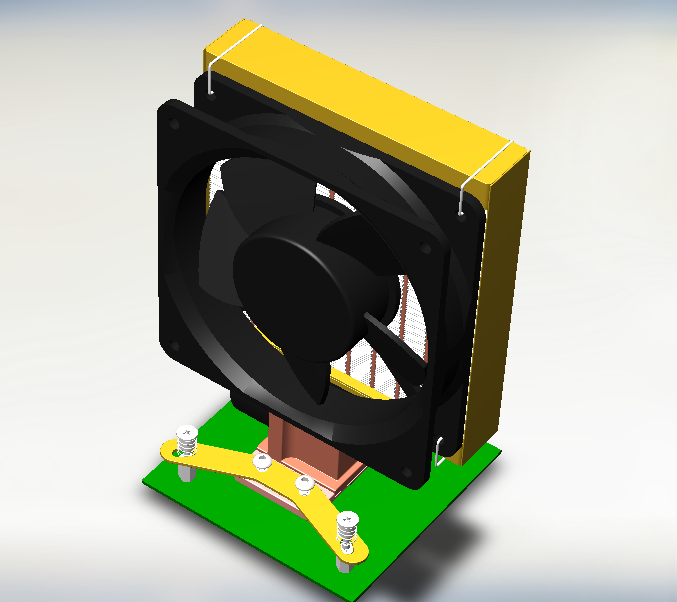 CoolClouds, Inc. has just announced that it will introduce a new class of heat sink for high-performance desktop computing in mid Q1 2014. Pre-orders can be placed immediately at fundable.com/coolclouds. CoolClouds has developed extreme cooling solutions for the world’s leading technology companies. SuprCool-PC™, its first consumer product, will serve overclocking gamers, professionals who require peak computer performance, and anyone who uses a computer in a hot environment. SuprCool-PC™ is the first “in chassis” heat sink to cool more than 300w in the latest Intel and AMD processors without hot spots at 65 degrees C case temperature in 25C ambient. Comparable in size to factory-installed heat sinks, it is reliable, quiet, easy to install, and effective even in high-temperature environments. These are quite impressive claims, but we’ll have to wait and see what kind of performance this product brings. We’ll be sure to get one of these to test just as soon as they are available. In looking through the data and information available on CoolClouds.net, I am hopeful since the firm was founded by seasoned industry veterans with experience in doing research for Intel, IBM, Sun Microsystems and more. High profile industry experts do not come cheap, nor is it easy for them to leave their safe corporate job to enter the high-risk world of startups, so I would suspect they are very confident in their products. As the press release states, you can actually pre-order the product by “backing” CoolClouds on Fundable. It’s similar to KickStarter, where users can invest in a startup by donating money and helping spread awareness. Outperform the best heatsinks on the market at half the noise-level? Sounds great to me. I can’t wait to see whether the performance lives up to that claim. Is it possible? Discuss in the comments and stay tuned for updates on the SuprCool PC! also if this is truly the case and the this works this well he should also start GPU heatsinks! I'm curious to what exactly they mean by micro channel cooling. If it is what I think it is, then it needs that liquid to be able to go 2-phase. I wonder how they would manage that since we don't hit the boiling point. Unless it's under a vacuum? I'm always down for more innovation, but your right the details aren't very clear in this article for how it plans to move all that heat with those tiny pipes. It's doubtful they are using normal water in it though, besides if the water did boil in the pipes the extra pressure could be a concern. If they apply a vacuum, the water could boil at say 40C. That would be a considerable vacuum though. As long as they design it correctly, the pressure could be managed. But as the pressure went up so would the boiling point. What a conundrum. Trying to imagine a steam cycle in such a small device at relatively low temps is difficult. Funny thing we use this concept at my job where we use thermo siphoning in our heat exchangers to cool refined heavy gasoline. The heat itself is continually moving fluid through the system and requires no moving parts for greater reliability. Very cool concept I just wonder about the 300watt claim... Then again our exchanges remove 237 million BTU an hour and its the size of a bus. It's a looped heat pipe. They probably use a working liquid fluid that changes phase at 40 or 50 deg. It's probably not water, but it depends on the pressure in the tube. I am also going to pledge $195 as this sounds intriguing and i wouldn't mind trying something other than the custom water cooling loop i having been running for the last couple of years. will they accept BTC/WDC :D? Ok, that makes sense. Then they probably just added micro channels to the part that absorbs the heat. Pretty ingenious. 237 million BTU an hour and its the size of a bus. Yikes! That's a lot of heat! Thanks for all the comments so far! I'm no expert in the field, but I've directed some of your questions to the folks at CoolClouds for some detailed responses. They are working on getting the data together now. We should have some answers within the next few days. We will provide a more detailed explanation of micro channel cooling with some illustrations and reference papers by tomorrow. There is no phase change but yes the micro channels provide very efficient heat transfer from the processor case to the heat sink. That is an important part of how we achieve the performance. As to the 300 W being high, we recently completed a custom engineering heat sink for a military customer that cooled 500W for an array of GaN/GaAs power amplifiers running in an ambient temperature of 60C in about the same size. Of course for that custom engineering project the cost to build was not as challenging as this product. My point is we are very confident that the specification can be made as this is the 6'th project using the same thermal model for the design. As to the suggestion for cooling refineries- sorry it won't scale to that level. We will provide a more detailed explanation of micro channel cooling with some illustrations and reference papers by tomorrow. My point is we are very confident that the specification can be made as this is the 6'th project using the same thermal model for the design. Hi, can you show the results/temps from a prototype on an overclocked system? Maybe, it could be compared to results from here. I believe it's a CLC pump, block, radiator.